Matthias Schmale is Director of Operations in Gaza for the United Nations Relief and Works Agency for Palestine Refugees in the Near East. Drinking water in Gaza is causing a rising number of its residents to fall ill and the UN says scarcity and pollution of water resources are at the forefront of the territory's scourges. GAZA CITY, Mar 21 2018 (IPS) - World Water Day (March 22) could not come at a more critical time for the people of Gaza who are facing a humanitarian catastrophe The recent decision by the United States to reduce funding for the United Nations Relief and Works Agency for Palestine Refugees in the Near East (UNRWA), jeopardizes its role as a critical source of clean drinking water when Gaza’s supplies slow to a drip. An estimated 1.2 million Gaza residents have no access to running water. For those who do, up to 97 percent of the water they receive is too polluted with salt and sewage to drink. The salt comes from seawater, which penetrates Gaza’s only aquifer when the water table drops too low. Palestinians in Gaza consume on average fewer liters per person per day than the World Health Organization recommends, and less than a quarter of the average per capita consumption in Israel. Nevertheless, the combination of rapid population growth and regional climate change extracts 200 million cubic feet of freshwater each year from an aquifer that receives only 60 million cubic feet of diminishing rainfall annually. As the water level steadily drops, more seawater seeps in, increasing the aquifer’s salinity. 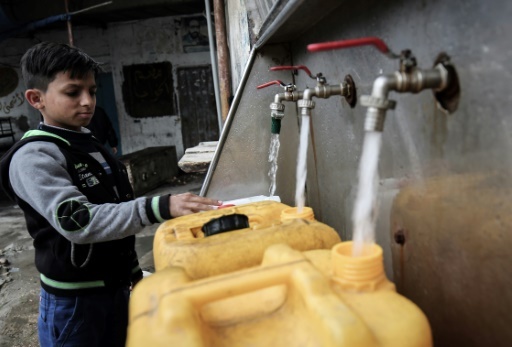 Only around 22 percent of wells in Gaza produce water with acceptable salt concentrations. The rest are anywhere from two to eight times saltier than global standards, with some wells exceeding the official standard for “brackish.” The high salinity puts Gazans in jeopardy of kidney stones and urinary tract problems. But high salinity is not the worst of Gaza’s water problems. Years of conflict have damaged or destroyed much of its critical water and sanitation facilities—including wells, pumps, desalinization plants and sewage treatment plants. The crippled infrastructure that survives can only be used the few hours a day Gaza receives electrical service. A newly completed World Bank wastewater treatment plant in Beit Lahia, for example, sits idle much of the time because Gaza doesn’t have enough electricity to run it. Without adequate facilities, untreated sewage backflows onto Gaza’s streets, and the equivalent of 40 Olympic-size swimming pools—more than 100 million liters—discharges into the Mediterranean Sea every day. The raw sewage contaminates 75 percent of Gaza’s beaches and washes ashore in adjacent Israeli coastal cities, elevating the risk that waterborne diseases like cholera or typhoid could trigger an epidemic. For 70 years, UNRWA has been fulfilling its mandate delivered by the UN General Assembly, including the United States, to provide humanitarian assistance, food, health care, and education and emergency assistance to Palestine refugees registered with us. When Gaza’s water situation grows dire, UNRWA provides clean water as emergency assistance in the best interests of its beneficiaries in Gaza. During the 2014 conflict, when hostilities destroyed critical facilities, and the flow of water to much of Gaza slowed to a trickle, UNRWA was there, trucking water twice a day to more than 90 UNRWA schools, where nearly 300,000 Palestinians sought shelter until the violence subdued. When Palestinians in Gaza struggle to access clean water, sanitation suffers and every child in Gaza is put at risk of contracting waterborne diseases. Last summer, the incidence of diarrhea in children under three doubled. UNRWA responded by teaming with humanitarian aid organization Mercy Corps on a project to provide the 30,000 refugees in the Maghazi camp—which experienced some of the highest incidences of diarrhea—with at least three liters of potable water per day. When, despite these efforts, poor sanitation triggers an outbreak of waterborne, communicable disease, UNRWA is there as well, employing over 1,000 individuals at 22 medical clinics in Gaza, caring for the sick and facilitating more than four million patient visits each year. The long-term solution to Gaza’s water crisis is a robust sewer and drainage system and restored water treatment facilities. But efforts to rebuild water facilities are limited because up to 70 percent of the materials required raise alleged “dual use” security concerns by Israel authorities and are either rejected or delayed from entering Gaza. Since 2014, only 16 percent of the nearly 3,000 items requested to rebuild Gaza’s water infrastructure have been approved for entry into Gaza. Until Gaza’s infrastructure is rebuilt, the area remains in constant crisis as demand for water increases, conditions worsen and functional infrastructure deteriorates. Yet, in January, the United States—UNRWA’s single largest and generous supporter for more than six decades—unexpectedly reduced its annual contribution by 83 percent (from $360 million to $60 million). UNRWA has a humanitarian mandate that is beyond politics and UNRWA implements this mandate in accordance with the four humanitarian principles adopted by the UN General Assembly. We function based on the mandate affirmed by the UN General Assembly, which has consistently renewed our charge since UNRWA was created, confirming the need for UNRWA to continue providing assistance pending a just and lasting resolution to the question of Palestine refugees. Humanitarian funding should be preserved from political considerations and remain consistent with universal principles of humanitarian assistance—humanity, neutrality, impartiality and operational independence. The U.S. funding reduction also jeopardizes UNRWA’s operations, including our life-saving provision of emergency water to Palestine refugees, our critical sanitation programs and the international community’s long-term efforts to rebuild Gaza’s water treatment infrastructure. When you are without it, water is more valuable than gold, even the limited amounts UNRWA provides during an emergency. Without UNRWA acting as an essential back-stop, Gaza’s ongoing water crisis could quickly devolve into a dramatic humanitarian catastrophe, affecting regional stability and undermining efforts to establish a lasting peace. The U.S. should reconsider its reduction of funding. It is in the interests of Gaza’s neighbors and would restore some hope for a life of greater dignity for many of the civilians living in Gaza.